AMERICAN INDIAN ISSUES: Grants help preserve fading native languagesWith soup and conversation in a college gym, members of the Spirit Lake tribe are trying to keep their language alive. People gather in the tribal college gym every other Tuesday for conversational Dakota language instruction. “To do it in a nonclassroom, nonthreatening setting, just to get people talking,” said Cynthia Lindquist, president of Candeska Cikana or “Little Hoop” Tribal College. Kiowa Children’s Books Boxed for Christmas DeliveryFive years after the release of her first Kiowa language textbook, author Alecia “Sahmah” Gonzales is compiling her five Kiowa storybooks into one complete box set targeted for audiences of all ages and backgrounds. Grounded in her own Native roots, the stories are both educational and entertaining. Readers see the bilingual stories in both Kiowa and English, shown parallel to one another on the page. For non-Native speakers, a special CD-ROM is included that features the author reading the story in both languages. Grants meant to preserve languageSen. Byron Dorgan, D-N.D., who is in line to be chairman of the Senate Indian Affairs Committee, said he pushed for the legislation because it is part of retaining Indian culture. Native language programs on some reservations have shown benefits beyond language, he said. "The healing is coming through the culture," Lindquist said. "Language and culture are entwined." Vanishing identity?Navajo President Joe Shirley Jr. expressed to the world the importance of Navajo language during a June speech delivered to the United Nations Educational, Scientific and Cultural Organization. The speech was in Paris. "For one to truly be Diné, one must speak the language of the Diné. Only in this way will one understand the songs, the prayers and ceremonies that have been passed down orally through countless generations of our people," he said. So when the 2006 Data Trends Summary for Annual Health Survey revealed that only 5 percent of Navajo school-aged children could speak Navajo fluently, tribal leaders and educators re-energized their effort, to find a way to keep and revitalize their language. They consider it the basis of Navajo identity. Native language preservation bill becomes lawA bill that will help tribes preserve their languages was signed into law by President Bush on Thursday. H.R.4766, the Esther Martinez Native American Languages Preservation Act, authorizes funding for new programs that tribes will use to prevent the loss of their heritage and culture. "These languages will be preserved with attention and effort. Once lost, they will never be recovered," said Ryan Wilson, the president of the National Indian Education Association. Kiowa elder tells tribal history through song[P]hysical infirmities cannot keep the 74-year-old Kiowa elder from a date he made with posterity. Several times a month, in the living room of his small wood-frame home, he sings old American Indian songs into a university professor’s digital tape recorder to preserve them for all Oklahomans, not just Indians. Since then, the pair has made a public service video in the Kiowa language about Indians and diabetes risk, and they recently posted a clip of Satepauhoodle singing in Kiowa on YouTube, the popular video-sharing site. Cap sales to benefit Cherokee programsIn efforts to preserve and promote its language, the Cherokee Nation has created baseball caps depicting the logos of three Oklahoma universities written in Cherokee. Fans of the University of Oklahoma, Oklahoma State University or Northeastern State University can buy the caps for $14.99 each at several Cherokee gift shops statewide. By Monday, about half the 720 caps ordered had been sold. About 70 cents of each dollar will go back to the nation for education, job creation, health and social programs, such as Cherokee language immersion classes. 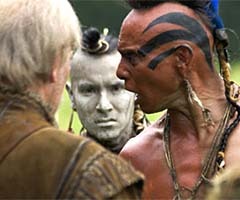 A Dead Indian Language Is Brought Back to Life[I]n a story with starring roles for a university linguist, sloppy 17th-century scribes and a perfectionist Hollywood director making a movie about Jamestown, the language that scholars call Virginia Algonquian has come back from the dead. The result, for Virginia Indians such as Custalow, has been a stunning opportunity--to speak in words that their grandparents never knew. Sauk language video pilot for series targeted toward pre-K language learning environment. Native language act ready for Bush's signatureA bill named in honor of a Native language teacher who died after receiving a national award for her efforts finally cleared Congress this week. "Native languages continue to diminish with each generation and the programs authorized by this bill will go a long way to restore this important piece of Native culture and bridge the gap between the old and young generations," said Sen. Tim Johnson (D-South Dakota).